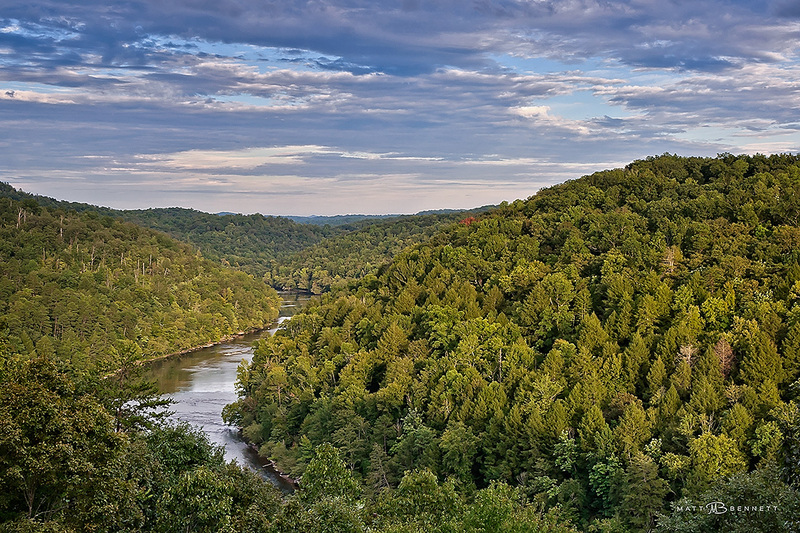 Cumberland Falls is located in the Daniel Boone National Forest in southeastern Kentucky about 20 minutes from the town of Corbin. It’s described as being the “Niagara” of the south, but it’s true claim to fame is being one of the few places in the world where the mist creates a “moonbow” on a full moon. I didn’t get to see the moonbow unfortunately because it was too cloudy. Landscape photography mostly comes down to patience and good timing. Wouldn’t you know it, about an hour or so later the skies cleared after getting back to the lodge and settled in for the night. I had originally planned to drive out and see this waterfall back earlier in the summer. However, due to scheduling I didn’t have enough time to make the trip. Then about 2 weeks ago, I saw where Holiday Tours was planning a trip to the falls over the Labor Day weekend. I decided to “take the plunge” (pun intended) and hop a bus out to see the falls. 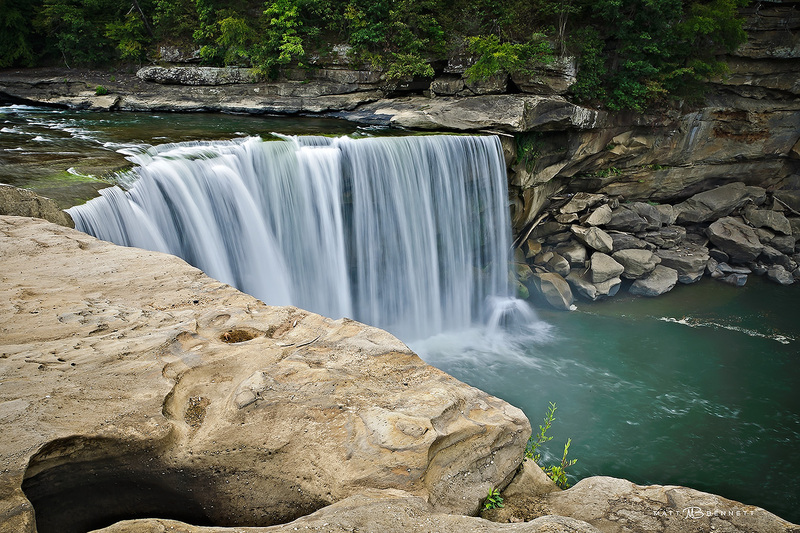 We made two trips to the falls; the first late that afternoon on the first day, and the second about 9:00 that night. While waiting that night for the moon to come out from behind the clouds, I met a young lady by the name of Jenifer Peace. She’s a really good local photographer there, and you can go to her facebook page to see some of her work. Anyway, she either stayed or came back later and was fortunate enough to capture the moonbow when conditions cleared. That image is on her facebook page as well. Another notable and highly photographed landmark there is the Gatliff Bridge, which is approximately 100 yards up river from the falls. 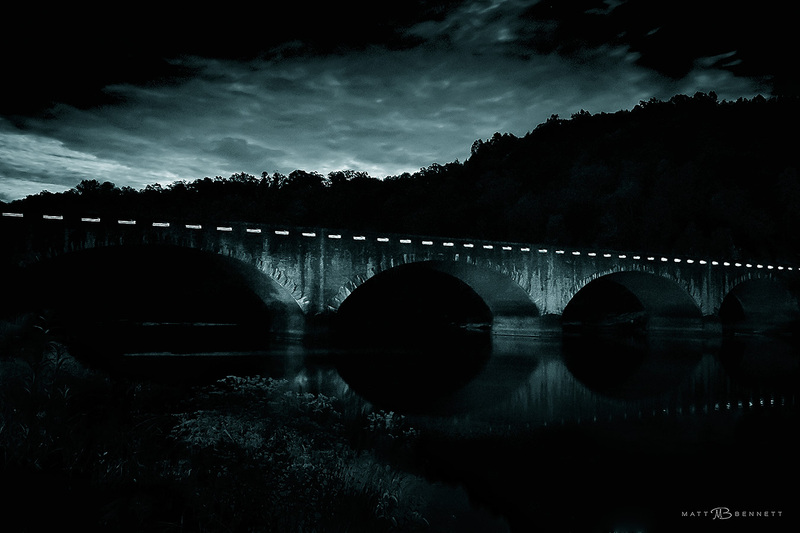 *This historic concrete arch bridge was built by R.R. Dawson Bridge Company, and was completed in 1954. I find it worth mentioning that Jenifer’s grandfather was involved in building the bridge, who was among several local men brought in to help meet the deadline of completion. Apparently it was modeled after a bridge from New York. Before that they had a ferry system set up to get cars across the river. I didn’t intend to photograph the bridge at night, and as a result I was presented with some challenges I wasn’t prepared for. The lights on top of the bridge are from cars passing over while making a long exposure. That made for a cool effect, but I didn’t get positioned correctly to get the shot I had hoped for. *Note: Correction to my information on the bridge. The CCC were responsible for building the lodge and the trails, not the bridge. Also, the bridge was completed in 1954. My apologies for these errors. Nikon D90 with 18-200 mm VR 3.5-5.6 lens. All images © Matt Bennett Photography. 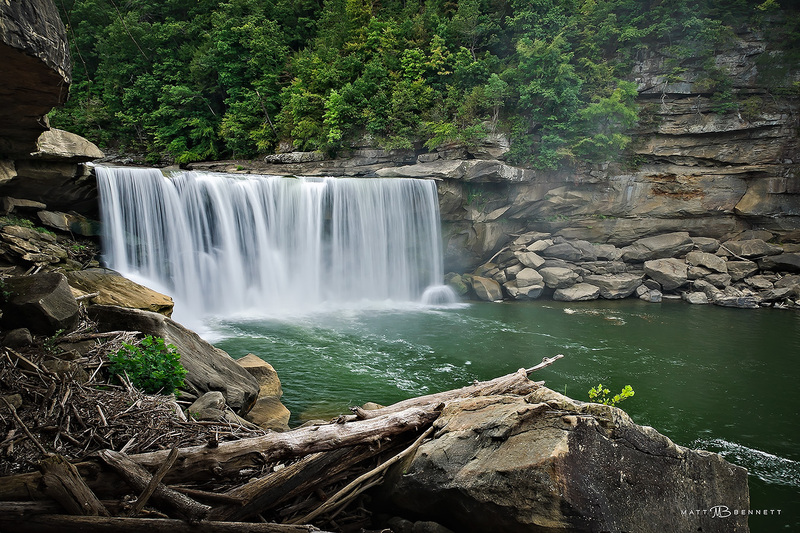 This entry was posted in Full Moon, Historical Landmarks, Waterfalls and tagged Kentucky, Waterfalls by Matt Bennett. Bookmark the permalink.